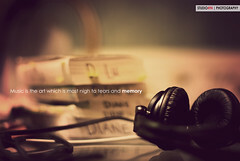 Music is a fantastic aide memoire. Just hearing an old favourite track takes me back to what I was doing when I was first introduced to the music. There's an implicit soundtrack to our lives that we build as children, at college or university and then later. So it's a shame if you can't browse your music by year. Most music players allow you to choose music from a specific year, but if that information is missing from your collection then you cannot navigate in this way. You need to provide the information yourself, or get software to do it for you. How is the year stored? In each track for a release, the year is stored in a 'tag' inside the music file. The tags should really be consistent amongst all the tracks for a particular release, otherwise inconsistencies will lead to ambiguity and disorganisation. To change the 'year tag' you need software. You can use a manual music tagger or you can use bliss. A manual tagger is handy and straightforward. The exact instructions depend on the tagger but generally you must select all the music files for a release, change the year and then commit the changes to the file. This takes a few steps, but it works. To change the year for a release, click on an album title to access the album detail view. Find the year and click on the current value. If there is no year, it will say '[unset]'. Type the new year value in and press return. The year will be updated in all tracks for this release. To be prompted with suggested years, and find all the albums without year information, enable the missing information rule. In the album overview screen, click 'settings' then click 'Fill in missing information'. Now, click the check box for 'Year' and apply the rules. 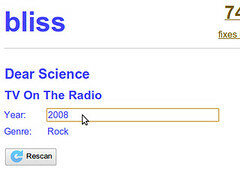 bliss assesses all your music, making sure it all contains the year information. If it doesn't, it will provide a handy suggestion which you can click to avoid any typing at all! Make sure to include year information for each album in your music collection. 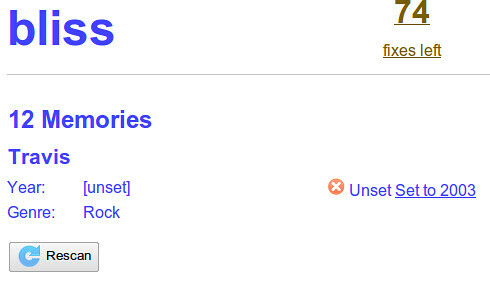 bliss makes it easy to find albums with missing year information and change the year so you can relive some memories! Thanks to Simon Hua for the image above.